A Focus on Fractions is a groundbreaking effort to make the mathematics education research on how students develop their understanding of fraction concepts readily accessible and understandable to pre- and in-service K– 8 mathematics educators. 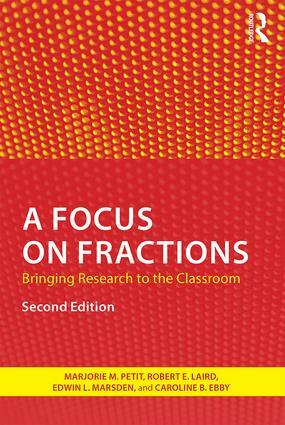 Using extensive annotated samples of student work, as well as vignettes characteristic of classroom teachers’ experiences, this book equips educators with the knowledge and tools to revealstudents’ thinking so that they can modify their teaching and improve student learning of fraction concepts. A Focus on Fractions 2nd edition includes sections on the Common Core State Standards for Mathematics and the Ongoing Assessment Project (OGAP) Fraction Framework integrated into each chapter as well as a new chapter on the OGAP Fraction Progression and how it can be used for formative assessment purposes. This updated edition assists teachers in translating research findings into their classroom practice by conveying detailed information about how students develop fraction understandings. Additional images and examples serve to flesh out and supplement the newly-introduced concepts in this updated and expanded edition. Looking Back Questions at the end of each chapter provide teachers the opportunity to analyze student thinking and consider instructional strategies for their own students. Instructional Links help teachers relate concepts from the chapter to their own instructional materials and programs. Big Ideas frame the chapters and provide a platform for meaningful exploration of the teaching of fractions. Answer Key posted online offers extensive explanations of in-chapter questions. New sections devoted to the CCSSM and OGAP Fraction Progression are woven throughout the book as well as a new stand alone chapter on the OGAP Fraction Progression. The OGAP Fraction Framework is an all-new eResource, now available as a free download from the book’s website: www.routledge.com/9781138816442. 3. What is the Whole? Marjorie M. Petit is an educational consultant in mathematics instruction and assessment and has provided leadership in the development and ongoing implementation of the Ongoing Assessment Project (OGAP). Robert E. Laird is a research associate with the Vermont Mathematics Initiative at the University of Vermont and a member of the OGAP leadership team. Edwin L. Marsden was professor of mathematics and former chair of the department of mathematics at Norwich University. Caroline B. Ebby, Ph.D is a senior researcher at the Consortium for Policy Research in Education (CPRE), an adjunct associate professor at the Graduate School of Education at the University of Pennsylvania, and a member of the OGAP leadership team.